2014 BBC North East Get Inspired Unsung Hero announced! 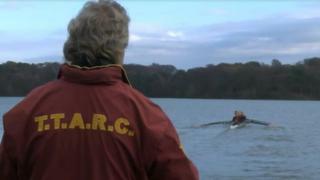 Graeme Mark has dedicated his time and enthusiasm to Talkin Tarn Rowing Club for nearly four decades. Having coached rowers who have gone on to compete at a national level, members say that Graeme's devotion to the sport has played a major part in the club's success. Graeme has been named the BBC North East 2014 Get Inspired Unsung Hero Award in honour of all of his hard work. Unsung Hero is one of the categories at the BBC Sports Personality of the Year. A winner is chosen in each BBC English Region and in Scotland, Wales and Northern Ireland. Each winner then gets the chance to join the sporting stars of today at BBC Sports Personality of the Year 2014 event in Glasgow. Now in its 12th year, the BBC Get Inspired Unsung Hero Award recognises and rewards outstanding contribution by individuals at the grassroots level of local sport, who give up their time on a voluntary basis so that sport can be played and enjoyed by people throughout the UK.